The MH-6 Little Bird proves that incredible things can come in small packages. These super maneuverable and highly adaptable single engine spec ops choppers have been known to fly down tight streets and to land where normal helicopter landings just aren’t possible. This ability is showcased in the rare video below. The 160th Special Air Operations Regiment (SOAR), otherwise known as the world famous Night Stalkers, are called special for a reason. And their fleet of a couple dozen, highly customized MH-6M and AH-6M Little Birds are among the most flexible helicopters in their exotic inventory. Operating from a six inch wide concrete divider may seem like showboating, but there’s more to it than that. Because Little Birds can get into very tight spaces, and often have to, sometimes landing on a wide, relatively flat surface is simply not an option. They need to be able to balance temporarily on anything they can. This can include building ledges or ship railings, often times at night and in adverse weather. You can see this tactic used operationally in Iraq and in training in the videos below. With this in mind, that concrete barrier is a perfect training tool for both the helicopter pilots, which are the finest in the world, and for the operators on the ground that have to learn how to board the MH-6’s “planks” under various conditions. 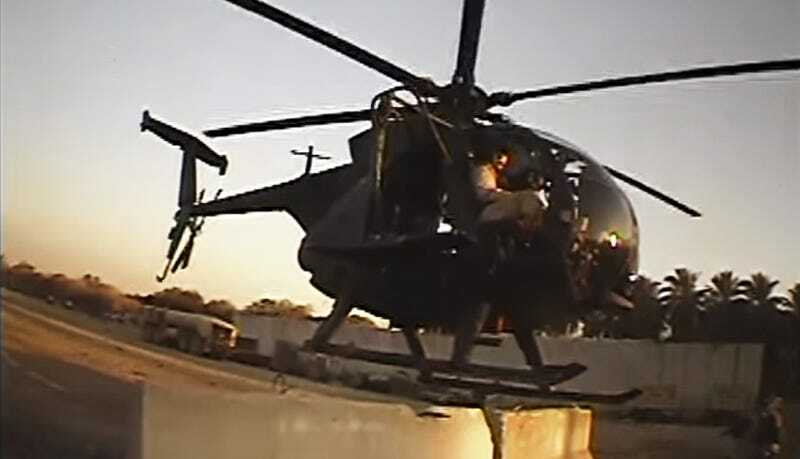 Like many other unique special operations aviation tactics, the crew of the Little Bird makes it look incredibly easy. This is a testament to their abilities, because it very much is not. Even though the helicopter traces its roots from the 50-year-old OH-6 Cayuse design, new variants are an increasingly hot item on the world’s arms market. Seeing as how it is ideal for counter-terror and counter-insurgency operations, there is a very good chance the Little Bird and its cousins will be landing on ledges for decades to come. Photo of stadium and Little Bird via DoD, Blackwater MD500 photo via AP. Hat tip to Funker530 for posting the video first.